text) and based on that following sibling column's value(text), I wants to select check box from 1st column. I have this scenario In one of my current project. Same way, I have to select checkbox based on preceding sibling column's value(text). See Image bellow. Here check box do not have Its own Identifier bet we have to Identify It based on related previous or next cell's text value. In this case, We can use sibling concept In XPath to locate preceding or following sibling element. 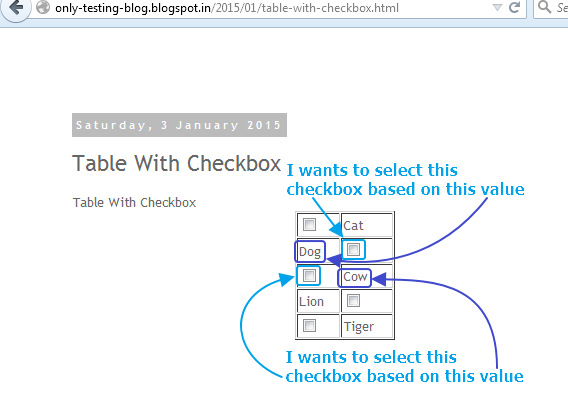 To select Dog checkbox, We have to use following-sibling In xpath as checkbox cell Is following to "Dog" text cell In table. So XPath to locate Dog checkbox Is as bellow. //td[contains(text(),'Dog')] will locate "Dog" text cell. /following-sibling will locate all siblings after the current node. Here Is reverse condition. Checkbox comes first and value text comes last so concept Is same but we have to use word preceding-sibling In XPath as bellow. //td[contains(text(),'Cow')] will locate "Cow" text cell. /preceding-sibling will locate all siblings before the current node. So now If you wants to write test to select above both textbox, It will be as bellow. //Locating element using preceding-sibling In XPath. //Locating element using following-sibling In XPath. You can use this sibling concept anywhere to locate any element like checkbox, radiobutton, textbox etc. If It Is dependent on other value.